Since I was a teacher for 5 years before we moved I really understand all the hard work that goes into teaching. Not many people understand or realize how much work teachers do to help their students be the best that they can be. Our family thinks the world of my daughters preschool teacher and her aide. I thought that I would make them a cute and simple little gift to show them how much we appreciate them. 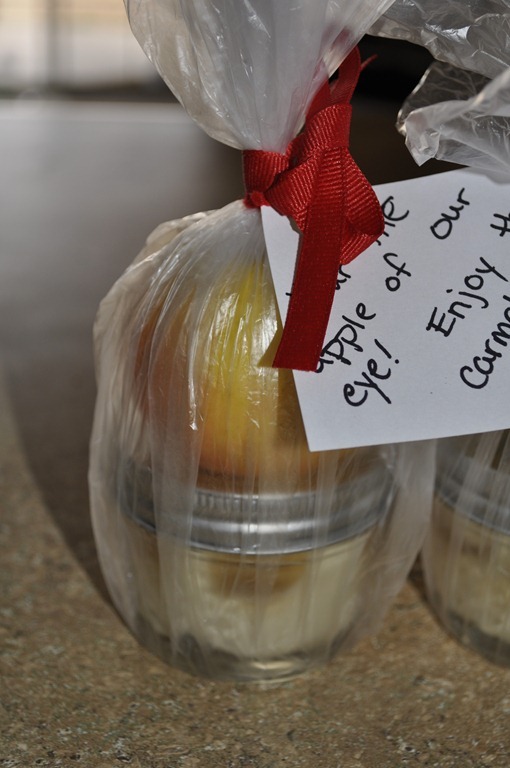 Since apples and teachers go hand in hand I made a Caramel Apple Dip and placed it in a small mason jar. Then I placed an apple on top and wrapped it up all together. Super simple to make and delicious. Show all those wonderful teachers out there how much we appreciate them! 1. Mix a generous scoop of caramel and the cream cheese together. 2. Fill a 1/2 pint mason jar about 3/4 full of the caramel cream cheese mixture. Top with Marzetti’s Caramel Dip and sprinkle on Heath Bits. Wipe off rim of jar and seal with lid. Wrap up with an apple on top or just serve with apple wedges. 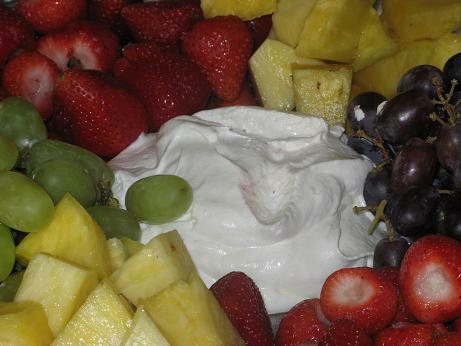 One of my favorite ways to eat apples is dipping it in this amazing fruit dip. Cream cheese mixed with marshmallow fluff, what could be better. It is great on any fruit! Strawberries that aren’t quite ripe and sweet, apples, cantaloupe, bananas, grapes, pineapple, any fruit your heart desires. Soften cream cheese and then mix with marshmallow cream. Enjoy with sliced fruit. Even though we didn’t get apples this week in our bountiful basket we get them almost every week. My family doesn’t seem to eat apples as fast as we get them and so I have been on a hunt to find something to do with them. I don’t want to make a dessert like apple pie or apple crisp because we just really don’t need to eat dessert every night of the week. 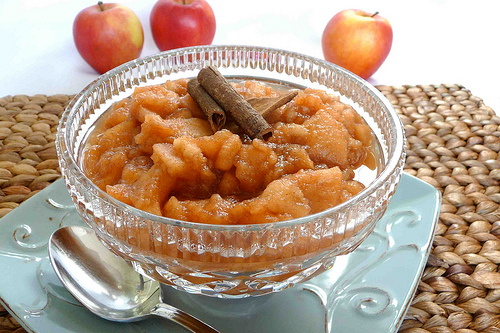 I have yet to try making apple sauce yet, maybe another day. So when I found baked apple crisps I was so excited to give them a try. I figured they would make great snacks for the kids and my husband. On top of all that all they are is apples and cinnamon so they would be a healthy snack! Basically this is the same a dehydrating your apples but since I don’t have dehydrator this was the next best thing. 1. Preheat oven to 250o F and use the fan element if your oven has it. 2. Line a large baking sheet with parchment paper or a non stick baking sheet. 3. Using a mandolin or food processor, slice apples to 1/8 inch thickness. If slicing by hand, core the apples to facilitate slicing and slice the apples as thin as you can. 4. 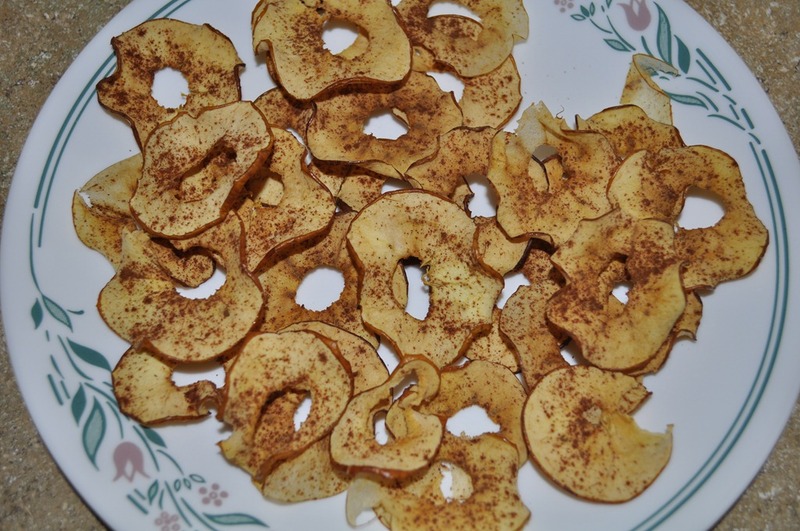 Arrange the apple slices on the parchment paper and lightly sprinkle with cinnamon. 5. Bake on the lower part of your oven (away from the heating elements) for 20 minutes, then gently turn the apple slices over and bake for another 20 to 30 minutes. Keep an eye on them towards the last 10 minutes or so to make sure they don’t burn. 6. Remove baking sheet or rack from oven and allow the apple to cool. The apples will come out a bit soft but will crisp up as they cool. 7. Store in an airtight container or bag. * 2 apples makes one small bag. I just made them in batches one day to have enough to last us a week or two. After about 5 years of marriage my sister gave us the Bride & Groom First and Forever Cookbook by Mary Corpening Barber & Sara Corpening Whiteford and said that she knew we were not newlyweds but that her and her husband had the book and loved almost every recipe inside it. It sat on our shelves for many years and recently we pulled it out and began cooking some of the recipes from it. One of the things that I love about it is that most of the recipes feed just 2-4 people which is great. That means there isn’t usually much left over. I am not a big fan of leftovers so I love this. Tonight we tried another recipe from the book and it was amazing. Combine the brown sugar, kosher salt, and rosemary in a small bowl and stir together. Coat the pork chops on both sides with the mixture, gently massaging the meat with your fingers to jumpstart the curing process. Let stand for 15 minutes. Rinse the chops and pat dry with paper towels. Season the chops on both sides with pepper to taste. 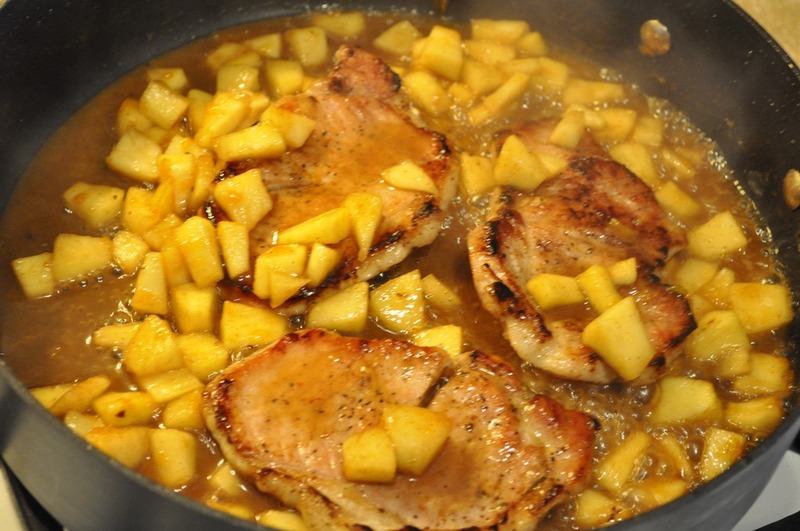 Melt the 1 tablespoon bacon grease in a large heavy skillet over high heat, add the pork chops, and cook until crispy brown, about 2 minutes on each side. Transfer the pork chops to a plate and cover with foil. 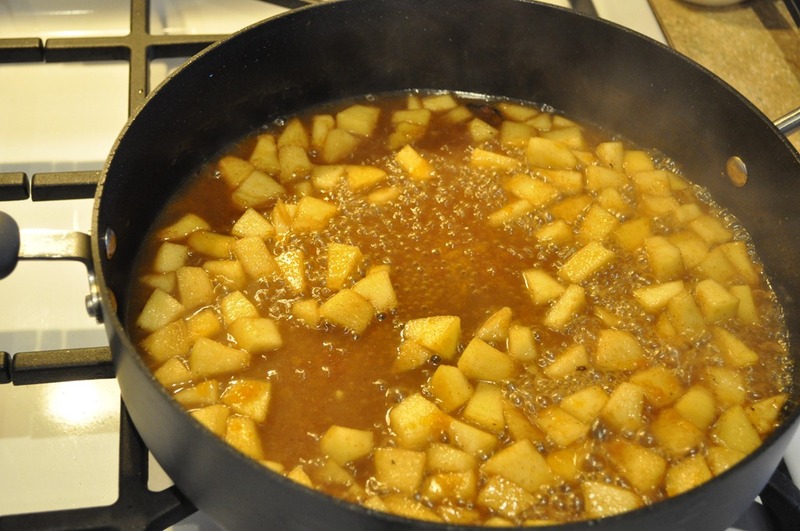 Add the apples to the skillet and cook, stirring gently to brown slightly, about 30 seconds, adding a bit more bacon grease if the pan is dry. Add the stock, jam, apple juice, and cinnamon and stir well. Cook until the sauce thickens and is rick brown in color, about 10 minutes. Add the pork chops back into the pan and cook for a few more minutes. My family, including my 1 year old and 3 year old loved this meal. I hope your family enjoys it too! 1. Combine the brown sugar, kosher salt, and rosemary in a small bowl and stir together. Coat the pork chops on both sides with the mixture, gently massaging the meat with your fingers to jumpstart the curing process. Let stand for 15 minutes. Rinse the chops and pat dry with paper towels. Season the chops on both sides with pepper to taste. 2. 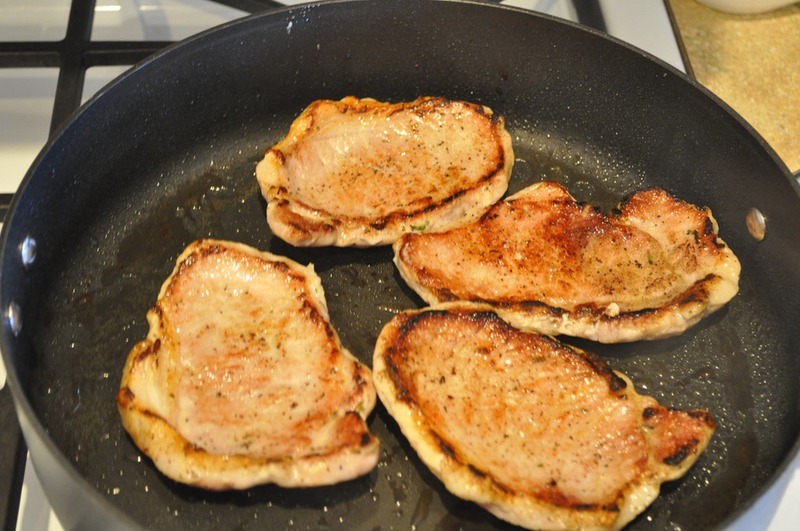 Melt the 1 tablespoon bacon grease in a large heavy skillet over high heat, add the pork chops, and cook until crispy brown, about 2 minutes on each side. 3. 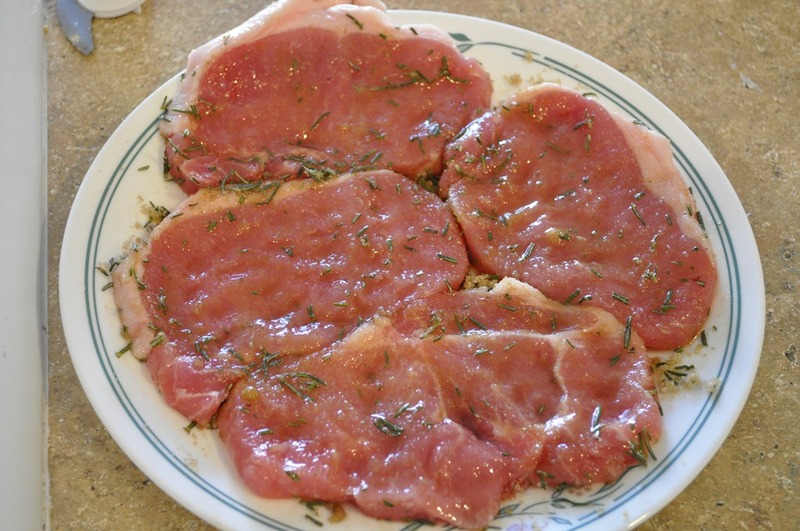 Transfer the pork chops to a plate and cover with foil. Add the apples to the skillet and cook, stirring gently to brown slightly, about 30 seconds, adding a bit more bacon grease if the pan is dry. Add the stock, jam, apple juice, and cinnamon and stir well. Cook until the sauce thickens and is rick brown in color, about 10 minutes. Add the pork chops back into the pan and cook for a few more minutes.